You’re new to going to Walt Disney World or new to the revamped Fastpass system known as Fastpass+ and you need a little help understanding how to optimize Fastpass+ usage in the theme parks. You want to have the easiest possible day in the parks and don’t want to run around in circles, so follow these steps to a great day in the parks by booking Fastpass+ in advance. Know your booking window. If you are staying onsite at a Disney World resort or Swan and Dolphin, you can book your Fastpass+ 60 days before your arrival date for the length of your stay. If you are staying off Disney World property, you may book your Fastpass+ 30 days in advance of your trip only. If you are uncertain when this window is exactly, check out my Crowd Calendars for your check in date. It also provides your 180 day booking window for your dining reservations. Set up your my Disney World Experience account well in advance. Visit www.disneyworld.com and establish your own account. Link your tickets if you are staying offsite and begin to familiarize yourself with the process of login and selection. You can book your Fastpass+ at 7:00am EASTERN on your reservation date (usually). The system can sometimes delay up to an hour, but the new Fastpass+ bookings are usually listed around Midnight. You may have to hit refresh a few times to get them to show up. Begin with the LAST POSSIBLE date and work backwards. Fastpass+ for Anna & Elsa and Seven Dwarfs Mine Train often book really quickly and many guests are frustrated that they couldn’t find them. They often begin with the first available date and work forward, but that is a mistake. Start with the last possible date you’ll visit the Magic Kingdom and work backwards. If you are unsure which Fastpass+ you should book first, check out my Fastpass+ prioritization guide. I’d also recommend you looking over my Fastpass+ optimized Touring Plans with Character meets to get great time slots. ONLY select the Fastpass+ that you REALLY want. If you want Anna/Elsa and 7 Dwarfs Mine Train, you might consider trying them on separate dates. Then choose two really low priority FP+ along with the one you really want. You can easily change those low priority ones for things like Big Thunder Mountain, Splash Mountain, Space Mountain etc after getting the primo FP+ that you really need. Take ANY time you can get for Anna/Elsa and 7 Dwarfs Mine Train. You can attempt to adjust the time later, if there is availability. Know what you can do if you still can’t find your FP+. 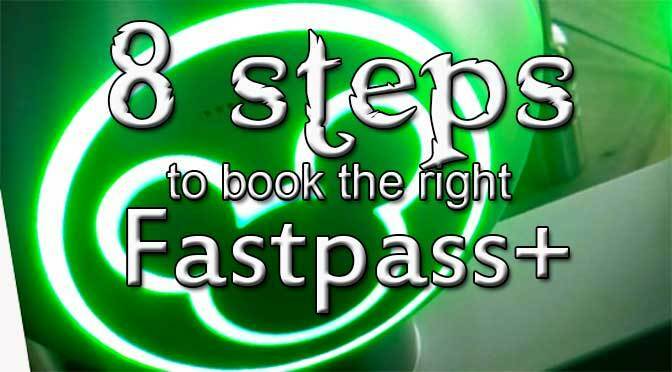 If you can’t find Fastpass+ for your entire group for the hard to find Fastpasses, check out my “How to find difficult Fastpass+” information guide that explains how to book single FP+ and manuever them to help you get what you need. You’ll be able to add FP+ one at a time in the park at a kiosk after you’ve used your three. It’s really rare to find a high priority FP+ at a kiosk. Availability may be limited. You can change FastPass+ at any time. Just click on the Fastpass+ that you wish to switch, but be aware that it may not place it in the same time slot. It might move the attraction up or down in your schedule. You can easily try to adjust it. I think Disney really needs to figure out a new system for Fast Pass’. It is sad that all the morning times are booked so fast because people know they can then book another one after those are done. It makes it very hard to enjoy your time in the park or try and go to two parks in one day and you are not able to get any fast pass’. We are also going to universal and i so far and excited to check out there unlimited ride option, we paid extra for this to stay at a nicer hotel and if it works out well we may change our plans from now on to just go there, because we will at least be able to hopefully get on the rides we want to. Disney is making it really difficult for us to enjoy our trip there anymore. I have gone since i was a kid and now we take my kids, we would go every year with my parents and now since my mother passed away we want to honor her and go but it is difficult when we are not going to be able to get on many rides. If you use Tap, Grab and Modify on http://www.characterlocator.com, you’ll not need to worry about it. I’ve done all 48 rides in a single day using this technique. Where is this tap grab and go method on the site? Kenny- you might want to update this, as you mention FP Anna/Elsa a lot and it being in MK. Shelley…what ever happened with this? We also had to reschedule and we also received the ‘extra’ FP. I am expecting that these are NOT the three time-based FP we can still book for our rescheduled trip, these are bonus FP for having to reschedule. Was this the case for you as well or were these ‘extra’ FP the only ones you could hold? We were lucky enough to book far enough ahead to get all of our original dining reservations back, including two PPO BoG breakfasts. Sorry you were not able to get all of yours. Yes, we were still able to book our normal 3 FPs per day. We had to reschedule due to Irma. Made our fastpass selections and now ‘extra’ fastpasses are showing up for all 4 parks in MDE. But when I try to book them it says the app quits working every time. Do you know if I can just walk up to an attraction and get in or if we need to prebook and keep trying to make the app work? Thx KTP! We will be having to use the child swap and my question is.. Can I book a FP+ for just my band and get a CS card for my husband? Or do we both have to have the FP+ for that time? Is this still true? My daughter wonr be tall enough to ride any rides so can I get FP for Rockin Roller and then my husband use the child swap? Then he can get a FP for tower of terror and I can use. Hips swap? The FP window actually opens at 7 a.m. now, right (not midnight)? I think I saw that change somewhere recently, but can’t seem to confirm it. Thanks! This is 7am Eastern, correct? We’ll be in HS on Monday, 12/7. We have a FP+ for the 5:00 Frozen Sing-a-long (return time 4:35-4:50). Do you think we’ll have time to squeeze in Character Palooza before it starts? I know that the current schedule isn’t necessarily what it’ll be that week, but let’s just say IF it’s happening at approximately 4:30. It really depends upon what you want to accomplish. Benefit of using fairly early is to get 4th in park earlier. My Touring Plans give exact times. The “handy tool that shows when Fastpass+ is actually available” link isn’t working. I’m coordinating a visit in September for a group of 20. Any special advice for attempting to get coordinated FastPasses for such a large group? Should I even attempt to get 18 (two of the 20 are infants) FPP’s at the same time for something like Peter Pan or Enchanted Tales or just skip right to 3 groups of 6 or ??? Do I even have a shot at that? Most of the big headliners would be a smaller group (6-10). Any and all advice would be much appreciated. Hi Kenny, is it better to book fastpasses for the afternoon and hit the ground running first thing in the morning or should I book fastpasses for the morning, therefore taking advantage of being able to add additional ones for the afternoon? How does FP+ work if you use the child swap? My son won’t be tall enough for space mountain when we go in October. Do we book FP+ for the rest of us and then notify the CM at entrance we want to use child swap with the FP? It used to be my daughter could ride with both of us when we used child swap, she’d go with me while my husband and son did something else, then go with my husband while i stayed with my son. Will this still work that way? Yes, just notify the CM that you need to use Child Swap and they will assist you. We booked a WDW trip only about 45 days out and are staying on property. Some of the attractions are listed as Fastpass limit reached (or something to that effect) so we missed out on the ability to book 60 days out. Do additional slots open up at the 30 day mark? No, but persistence can pay off if you keep trying. You can cancel all or some of your fastpasses. I’ve read elsewhere that some FP+ reservations are “held back” until the “day of” – that is, they CAN’T be obtained in advanced. True or false? What is a “stand-by” line? I see that term used a lot. Regular old wait in line. Say I have FP+ for SpaceMountain at 10am (10am to 11am time frame), and when I present myself, I see that the regular line is very short. Can I decide to save my FP+ for that attraction and get in the regular line? If yes, when do I change that FP+ for another attraction, say Dumbo? 2. Or after my ride? (is that even possible?) Or will the CastMember still validate my FP+ before I get on the ride even if I am in the regular line? Sure, you aren’t required to use it. You could use it for a second ride or change it to something else. Once you tap at a Fastpass entrance, you’re locked in though. Link is fixed, thanks for notifying me! Does this also apply to people staying offsite? Only difference between on and offsite is onsite books 60 days out and offsite and annual passholders book 30 days out. Hi Kenny, I’m a little confused about what you meant by “starting with the last possible date first.” Do all of the days of your trip open up to reserve FP+ 60 days beforehand if you’re staying on Disney property? Or do the days of your trip open up individually, each one 60 days beforehand? Thanks! Your website is the best planning website I’ve found, and I have looked at a lot of them. It may be bordering on obsession lol. Yes, you can book for length of stay beginning with the last day and working backward.